Work on the $300 million project will start “as soon as this summer,” Verizon Wireline Network president Bob Mudge said. Verizon is finally ready to offer its high-speed fiber optic service to Boston — a victory for city officials who have long sought meaningful competition for high-speed Internet and TV service in a city dominated by Comcast Corp.
Mayor Martin J. Walsh announced the Verizon move Tuesday, a $300 million investment that will roll out in select neighborhoods beginning this summer but will take six years to cover the whole city. Boston has also agreed to speed up permitting for the infrastructure upgrade and to begin the process of licensing Verizon as a cable TV provider. Verizon’s surprise decision follows years of attempts by Boston officials to persuade it to offer the broadband service here, including accusations from former mayor Thomas M. Menino that Verizon was dragging its feet because of an unrelated dispute with the city over a tax of its property worth millions of dollars. Boston and company officials said high-speed Internet is a necessity for the kinds of high-tech businesses Walsh’s administration has courted since taking office. The move into Boston is a sharp turnaround for Verizon. In 2009 the company said it simply hadn’t gotten around to wiring Boston for FiOS, the name of its fast Internet, video, and phone service. A year later the telecommunications giant said it would no longer add any communities to the fiber network. In 2015, the mayors of 14 East Coast cities, including New York City and Worcester, wrote Verizon chief executive Lowell McAdam, accusing the company of failing to deliver high-speed service to their residents. When Walsh took office in 2014, he vowed to improve broadband connections, especially after members of the city’s thriving startup community complained about the lack of affordable high-speed options. City officials said the deal was brokered by New England Patriots owner Robert Kraft, who developed a relationship with Walsh after his election and agreed to introduce the mayor to McAdam. Walsh aides and Verizon executives had previously met in early 2014 but failed to reach a deal. Over a lunch meeting at Kraft’s home in Chestnut Hill in September, Walsh made his appeal directly to McAdam, which triggered more involved negotiations among their subordinates and led to a second meeting between the parties at Kraft’s home in December. The deal was finally reached a few weeks ago, Koh added. Kraft said he told McAdam that Boston would be a perfect place to test Verizon’s “Smart City” technology. Such testing involves experimenting with sensors and advanced signal controls to reduce congestion. In this case, city officials said, it could eventually address such concerns as energy efficiency. “I said to him, ‘I don’t think there’s a better city for you to commit the resources to, to make it a Smart City,’ ” said Kraft, who has known McAdam for years. Kraft downplayed his role in the talks, saying Verizon executives and city officials deserve the credit. Franklin-Hodge said the city isn’t offering tax breaks or other giveaways to entice Verizon to build the fiber-optic network. Instead, the company will pay Boston about $4,100 per month to bankroll the expedited permit approvals, and the city has agreed to cap any increases in some administrative fees during the project. The fiber-optic upgrade is expected to start in Dorchester, West Roxbury, and Dudley Square this year, then move to Hyde Park, Mattapan, Jamaica Plain, and additional parts of Roxbury. Verizon also is expected to install wireless access equipment to the city’s utility poles and street lights to improve its mobile phone service. 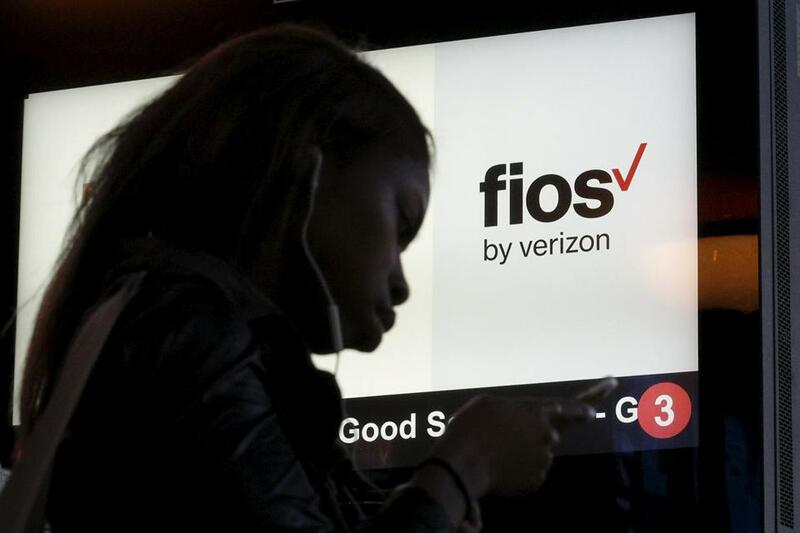 Verizon said it will be able to offer FiOS Internet at speeds up to 500 megabits per second. Its current service, as measured by Speedtest, an independent measurement site, reaches just 7.53 Mbps in the city. Speedtest.net lists Comcast’s Xfinity service as the fastest in the Boston area, with download speeds of about 106 Mbps. RCN, a smaller provider, is ranked second at nearly 101 Mbps. Higher speeds allow users to more reliably send large files, watch movies, and play video games online. Netflix requires at least 3 Mbps speeds for a standard-definition streaming movie but recommends speeds of at least 25 Mbps for the highest HD quality. “Comcast has invested billions in one of the most extensive fiber-based networks in the country, and we love our competitive position here,” the company said. In a report on high-speed Internet access last year, the Federal Communications Commission said 45 percent of American households have only one provider for such access. “We have seen first-hand that competition does in fact encourage other providers to build-out or upgrade broadband services,” the commission wrote. A good example of that dynamic is Google Fiber, the Internet giant’s push to install high-speed Internet in select US cities, said Deb Socia, executive director of Next Century Cities, an Internet advocacy group. Verizon hasn’t yet disclosed how much it would charge for fiber Internet or TV services. Online, the company advertises a 150 Mbps Internet-only package for $75 a month, while a similar package from Comcast was listed online at about $83 per month. Curt Woodward can be reached at curt.woodward@globe.com. Follow him on Twitter @curtwoodward. Jon Chesto can be reached atjon.chesto@globe.com. Follow him on Twitter @jonchesto.